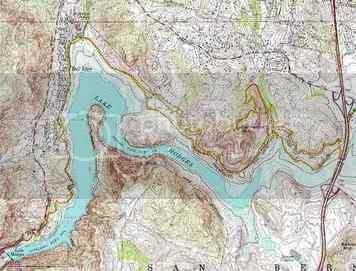 Lake Hodges is located near Escondido in Northern San Diego county. Hodges is a pretty good all around fishery. It can be especially good for crappie and carp fishing. Lake also has a good population of good sized largemouth bass. When full, the reservoir has 1,234 surface acres, a maximum water depth of 115 feet, and 27 shoreline miles..
From Interstate 15, exit on Via Rancho Parkway, go west to Lake Drive, then south to the lake entrance. From the entrance it's about one mile to the concession/launch area. Lake is open Saturdays and Sundays from sunrise to sunset from February through October. Rental rowboats and motorboats are available for fishing and recreational boating. Private boaters are welcome and only need pay a small launch ramp usage fee. Canoes, kayaks and float tubes are permitted, however float tubers must follow standard regulations which include waterproof waders, 144 sq. in. orange for visibility, horn or whistle and spare floatation device. Float tubers must stay within 150 ft. of shore at all times. No swimming or water contact allowed. rainbow trout,channel catfish,bluegill,largemouth bass,crappie,bullhead and carp.